One decision facing business managers is the method used to value inventory. * The decision has a great impact on a business’s organization and day-to-day operations, and must be considered carefully before a costing method is adopted or changed. There are many inventory valuation methods. The two most common methods used in the heavy-duty transportation industry are average cost and replacement cost. What is the average cost method? The average cost method is used when inventory is valued at the average cost of all the parts that are currently on hand. The parts are received into inventory at the purchase cost and the average cost is recalculated. Inventory is relieved by the average cost of the parts on hand when they are sold. What is the replacement cost method? The replacement cost method is used when inventory is valued at a cost per item, which typically comes from a price file or price list supplied by the vendor (supplier). When purchases are made for an amount that differs from this supplied cost, the difference must be accounted for to an account other than parts inventory. The inventory is relieved by the replacement cost of the parts on hand when they are sold. 1. What is the difference between average and replacement cost methods? 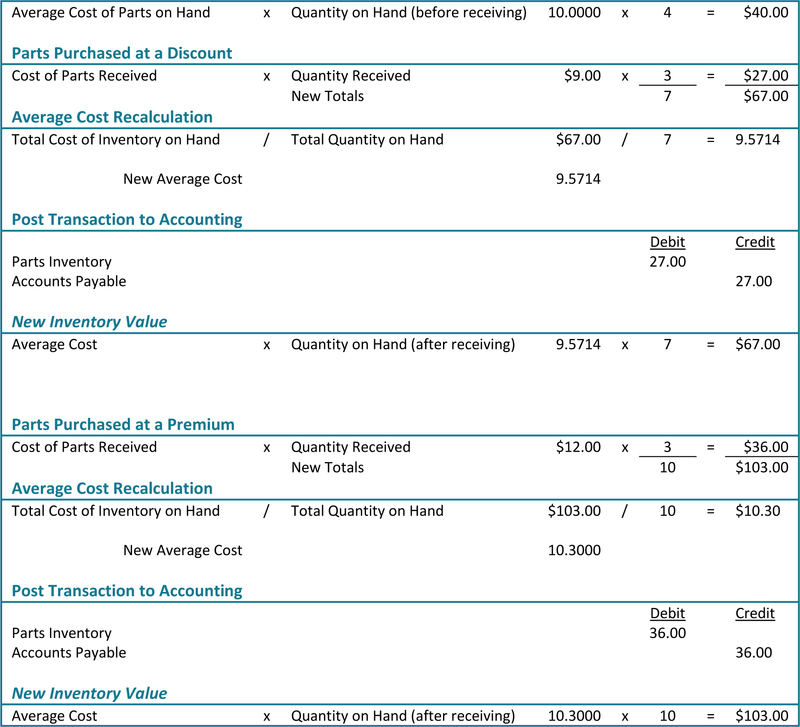 In these two methods, there is a difference in the process for receiving inventory and posting it to the General Ledger. The business system should be able to do the calculations for average cost. Accordingly, the accounting entry is simple and can be done by a clerk in the Accounting Department. However, in replacement cost, employees will need to calculate the difference between the actual purchase price and the replacement cost by deciding where to enter the difference. While this is a simple task to complete, it must be applied to every transaction, which can accumulate time and effort quickly. 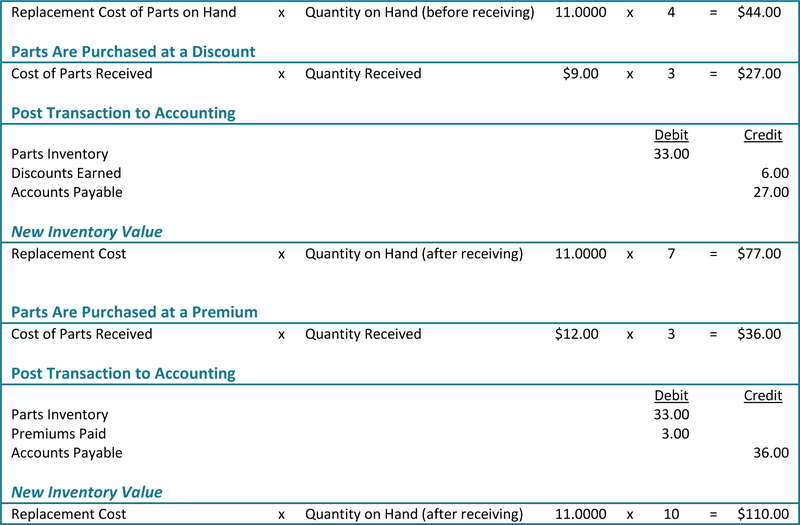 In addition, the decision for discounts and premiums is often made in the Parts Department, which again adds time to the process, delaying the posting of the AP invoices. Since the majority of purchase transactions will likely be at a cost other than replacement cost, an extra line of detail is needed for the AP clerk on invoices. Like the employee calculations, this may seem a minor task, but when multiplied by the volume of parts invoices, it becomes a much larger task. 2. How do you want to handle price file updates from vendors? If average cost is used, nothing needs to be done. The new prices will be implemented as business continues. However, if replacement cost is used, a report should be run in the software that quantifies the value of inventory on hand that has changed due to the application of updated price. In an inflationary society, this will typically be an increase to the inventory value, with the offset as income. It is a common practice in the heavy-duty transportation industry not to record this gain when the update takes place. This is done because, usually, the software cannot calculate the amount. Also, when physical inventory is taken, the increase will offset any potential in ventory problems. The reconciling amount will be minimal or potentially show a gain. This is not a good practice. Other inventory issues, such as theft, damage or poor warehouse practices, may be masked by this process. It is recommended to book the differ ence created by the price update and treat the physical inventory as a separate issue. 3. How do you value slow-moving parts? If replacement cost is used and the increases typically associated with updates are recorded, over time the value of slow-moving parts is inflated. In average cost methodology, these parts remain in the inventory at their value at the time of purchase. Using average cost, reports based on value presents a more accurate picture of slow – moving or obsolete inventory. 4. How do you pay your employees? If purchasing is done well, average cost should generate lower costs, which generates higher gross profits at the time of sale. This must be addressed in deciding how employees are paid. If inventory uses average cost methodology, sales personnel should be able to be paid on replacement cost. Executives must determine whether to pay sales personnel based on the results of good purchasing or not. In addition, some purchasing decisions may have been to invest significant cash in inventory to buy more than would be stocked to take advantage of a good deal from a vendor. Most companies do not want to give employees a raise simply because they were willing and able to invest in inventory. 5. How do you monitor purchasing? Either method allows the ability to monitor the job being done by purchasing. If average cost is used, reports should be run to compare average costs to replacement costs. If replacement cost is used, monitoring the purchase discounts and premiums paid accounts should provide an easy metric for the job being done. It is recommended that these accounts be maintained separately rather than posting both the losses and gains to the same account. Purchase discounts should be numerous and premiums paid should be rare if inventory is being managed properly. 6. How do you time posting income to the business? If purchasing is done well—buying parts in volume and taking advantage of available programs—parts should be consistently bought at a discount. By booking discounts earned at the time of purchase, income is recognized at the time of purchase rather than at the time of sale. For example, if $2,000,000 is sold a month at a 26 percent gross profit, there were purchase discounts of two percent and inventory is turned five times a year, parts inventory would be overstated by $96,000. This amount is income that has been realized at the time of purchase rather than at the time of sale and that taxes have likely been paid on. If purchasing habits remain the same, the tax on this amount is, in essence, an interest-free loan granted to taxing authorities forever. In addition, the practice of recognizing income at the time of purchase rather than the time of sale can be particularly dangerous if the purchasing manager or parts manager has compensation based on net profit. than at the time of purchase. results by improving ROI, mitigating risks and achieving operational excellence. Serving more than 1,800 locations across North America, Karmak is an employee-owned company with headquarters in Carlinville, Illinois.